Summer is almost here. 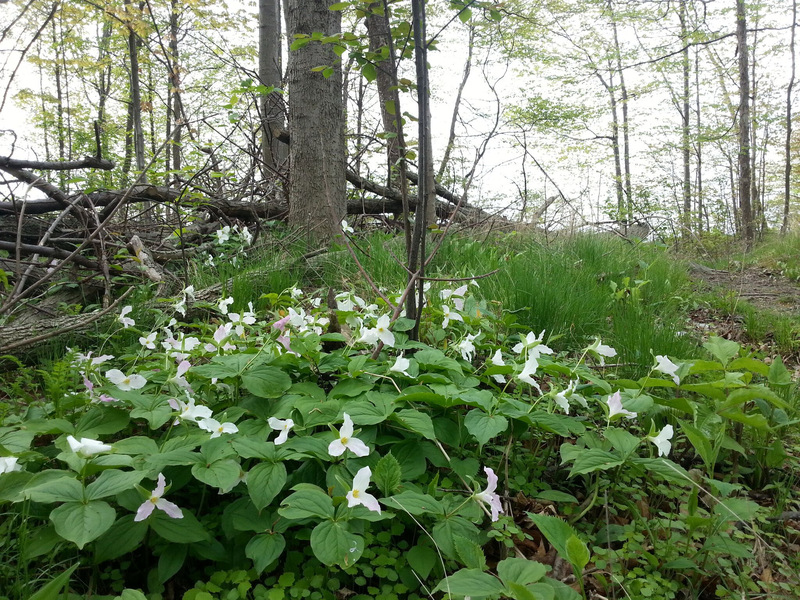 At Guild Park, the woodland trilliums and apple trees have already blossomed and more than 400 visitors have enjoyed the first round of our popular walking tours. Ontario’s provincial flower, the trillium, in blossom in Guild Park’s woodlands. 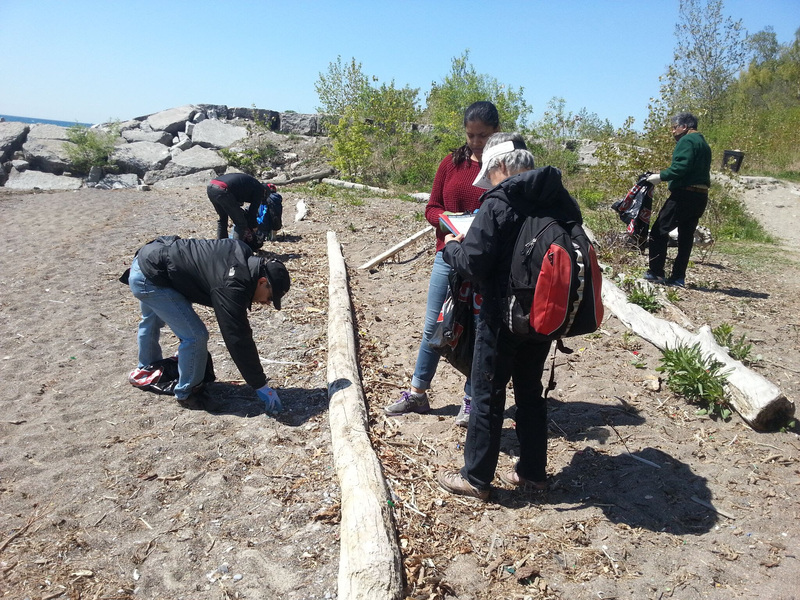 As well, a hardy band of “green” volunteers – people from the community and a local school - have scoured a section of Guild Park’s waterfront as part of the Great Canadian Shoreline Clean-up. the 2015 Guild Alive With Culture arts festival. The good news is that thanks to the efforts of volunteers, Guild Park continues to attract local residents and other Torontonians. During the recent Doors Open tours at Guild Park, about 75% of the participants visited the park for the very first time. They were happy they’d made the trip. This year, more than 92% of Doors Open - Toronto visitors rated their Guild Park tour as “excellent” – the highest possible evaluation. This result confirms what so many of us have known for so long: Guild Park is a special place – where Art Meets Nature. It’s unique to Toronto and anywhere else in the world. Let’s remember how far the park has come in the past 18 months. Guild Park is now well on the road to recovery after last year’s devastating combination of ice and insects. The 2013 ice storm and the Emerald Ash Borer resulted in cutting down more than 3,000 dead, dying and damaged trees in the park. Thanks to the work of the City of Toronto’s forestry and parks staff, much of the immediate damage has been repaired and new trees planted. To keep moving forward, Guild Park now requires a new round of pro-active – not reactive – activity. It’s time to bring together all the park stakeholders and the best of Guild Park’s past plans and proposals to produce one, integrated Master Plan for the entire site. Such a Master Plan is the way to start planning and managing this 88-acre site as a single entity, something not done since 1978. That’s the year Spencer Clark handed over the keys of the entire Guild operation to the province of Ontario. For more than a generation since then, responsibility for this property has been divided and subdivided. Today, work at Guild Park seems to be done according to department priorities rather than park priorities. Keep reading to find out how many departments it now takes to run Guild Park. Doing work on a “piece-meal” basis means Guild Park lacks a unifying plan, without anyone taking overall responsibility. As a result, public meetings are infrequent, few opportunities exist for people to provide ideas and feedback, and there’s no simple way to track what’s being planned or even underway at Guild Park. It’s not surprising that, compared to other renewed and revitalized places in Toronto, Guild Park has yet to see the benefits of meaningful public input. A Master Plan for Guild Park would start to make a difference. Effective Master Plans combine informed public comment and professional expertise. Master Plans result in synergies – thanks to overall efficiencies – and “scorecards” that objectively measure short-term progress against long-term park priorities. In short, a Guild Park Master Plan would encourage best practices, effective partnerships and accountability. These are ingredients that will turn what Heritage Canada described in 2010 as the “demolition by neglect” of the old Guild Inn into an era of revitalization for the entire property. Commissioning a Master Plan is one of three initiatives for which Friends of Guild Park advocates. We’re also calling for the appointment of a Guild Park “commissioner” responsible for the entire site; and ensuring there’s an informed and strong public voice in Guild Park’s future. Are supported by Guild Park staff, by City officials and community groups – all those with a big stake Guild Park’s future. You can learn more about this in the newsletter. One way to show your support for these initiatives is to be a member of Friends of Guild Park. Information about joining and renewing is included with this newsletter and also available atwww.guildpark.ca/membership. Another way is get things moving ahead to simply phone 3-1-1, the City’s info line, and say it’s time for a Master Plan at Guild Park. If enough people call on this issue, decision-makers at City Hall – including Mayor John Tory – will receive your message loud and clear. We also encourage you to come to Guild Park and enjoy the many events taking place on the grounds over the summer months. You’ll find details about all that’s happening in this issue. If you’d like more information or have a comment or question about any aspect of Guild Park, feel free to send an email to president@guildpark.comor add a post at www.facebook.com/guildpark. I look forward to hearing from you and seeing you at many of the upcoming events at Guild Park & Gardens. A spectacular apple tree beyond the gates of Guild Park. 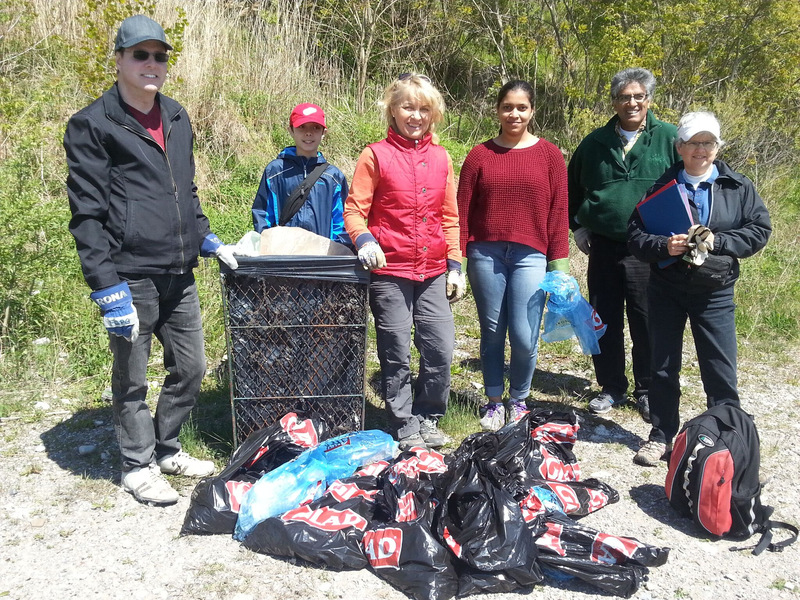 An energetic group of people, including students and a teacher from Laurier, cleaned approximately two kilometres of trails, roadway and shoreline, removing more than 40 kilograms of garbage and recyclables from Guild Park. Volunteers, including organizer Rose Mitchell Spohn (right), at the Spring 2015 Great Canadian Shoreline Cleanup at Guild Park. Clearing Guild Park’s beach of plastic, fireworks remains and other garbage at the Great Canadian Shoreline Cleanup, May 23, 2015. 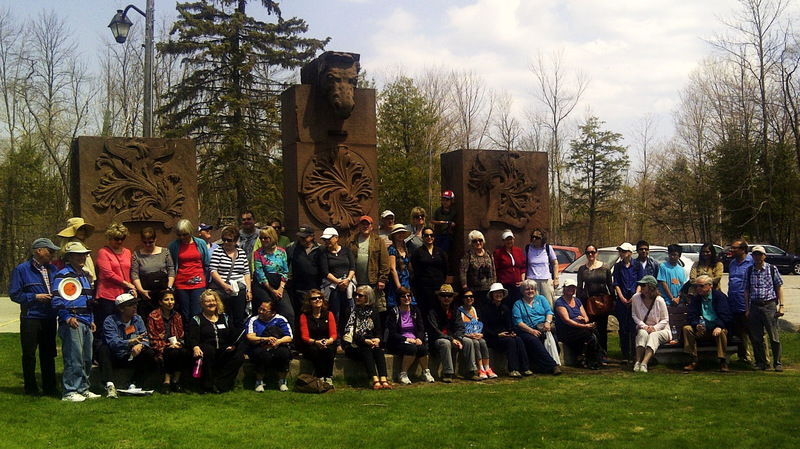 It was perfect weather on May 3 as more than 80 people attended Jane's Walk at Guild Park - about two-thirds of our guests were first-time visitors! People were fascinated by the history of Rosa & Spencer Clark, who founded the Guild of All Arts on the site. Visitors connected with stories about the artist community and the Guildwood neighbourhood that the Clarks built on their property. People were also captivated by the "stories in stone" that the Clarks left behind on the grounds in the form of art and architectural artifacts. Some of our walkers talked about their own personal connection to Guild Park - a honeymoon at the old Guild Inn, swimming in the hotel’s long-gone pool. One special guest was the cousin of Aage Madsen, the Danish-born Canadian sculptor and wood worker, who built the log "sculptor's studio", which still stands at Guild Park. The first-ever Jane’s Walk at Guild Park attracted dozens of visitors from across Toronto. Our visitors took a special interest in the various "provincial panels" which depict the resources and features found across Canada. Thanks to the Jane's Walk volunteers - Dustin, Ryan and John - who helped give out the Jane's Walk buttons and other materials. Many Guild Park visitors were surprised by the visible neglect seen on so many of the surviving architectural artifacts, the deteriorating (or missing) public art and the dilapidated condition of the original Guild Inn building. Information about the proposal to fix and augment that structure was greeted as good news. Yet the looming loss of the site's now-restored stone garage and tennis court is clear evidence there's no integrated planning approach for the entire grounds. Visitors agreed it was time for the City to begin a long-term program for revitalizing this unique and important public space. 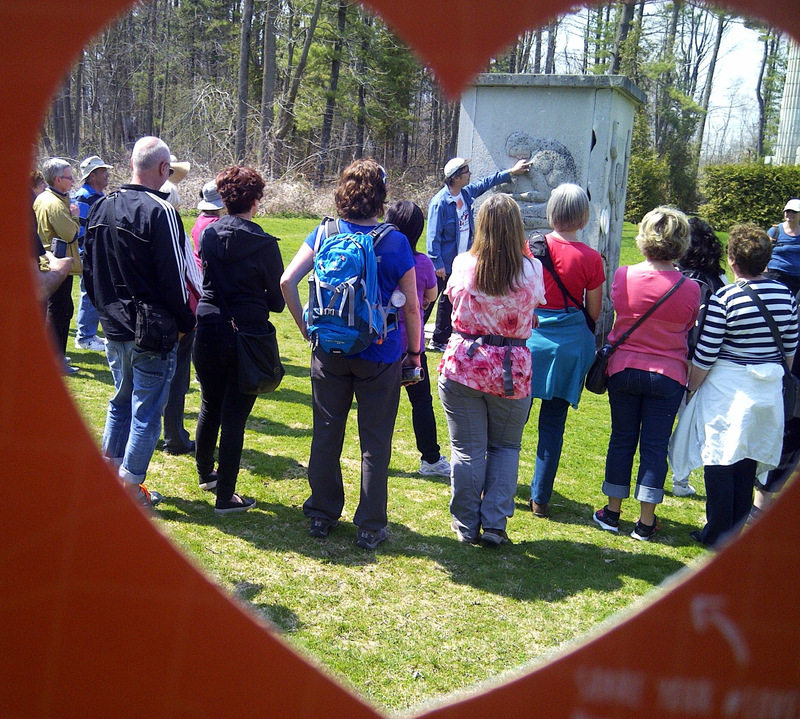 As seen through the Jane’s Walk “heart” frame, Guild Park visitors learn about the “Alberta” provincial panel, sculpted by Jacobine Jones. (Photo by Ron Spohn). Mayor John Tory: Guild Park is a "precious jewel"
Toronto’s Mayor, John Tory, described Guild Park as a "precious jewel" and called for creating a comprehensive Master Plan for the site at a meeting held March 24 by the Guildwood Village Community Assn (GVCA). Speaking to about 150 Guildwood residents, Toronto's mayor recalled his meetings in the 1970s with Rosa and Spencer Clark, founders of the Guild lnn. He noted that the couple "were ahead of their time" for their appreciation and preservation of Toronto's architecture, which the Clark’s displayed on their grounds. Mayor Tory attributed the current state of Guild Park to the lack of clear accountability among the numerous Toronto departments, each with only "partial responsibility" for certain aspects of the 88-acre site. 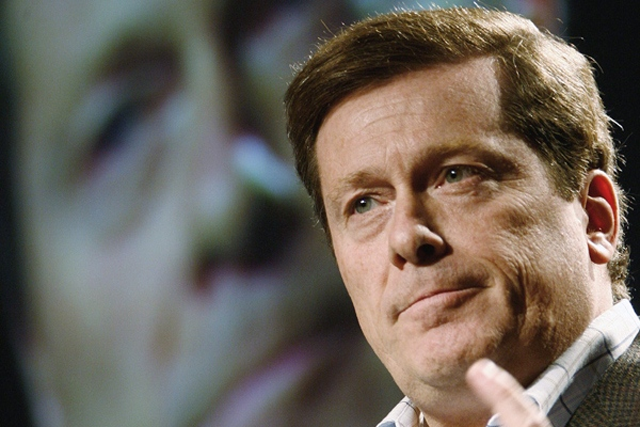 Referring to the success he had as chair of the revitalization project for Ontario Place in 2013, Mayor Tory noted that Guild Park must have a "flag carrier" among city staff. He said he'd support local City Councillor Paul Ainslie to ensure positive progress is made to revitalize Guild Park. Also at the GVCA meeting, Councillor Ainslie said he was "very positive" that the final agreement would soon get signed between the city and Dynamic Hospitality, the private company already approved by City Council to operate a restaurant and related services at Guild Park. The councillor said that the two sides had already signed both a lease and an operational agreement, so only approval of the site plan remains outstanding. He added that he would be announcing a public meeting regarding the Guild Park restaurant in the future once all the agreements are in place. He also said that Guild Park's stone garage, which was restored by the City after 2012, would likely be demolished. In April, the Guild Park family of volunteers was deeply saddened by the sudden deaths of two people who contributed so much energy and skill to revitalizing Guild Park. 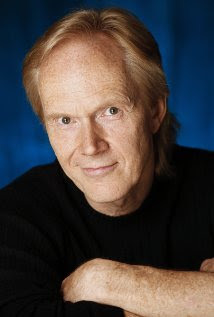 Sten Eirik, founder and artistic director of the Guild Festival Theatre, died of complications from cancer. Ross Sturge, a volunteer board member of Friends of Guild Park, died of a heart attack. Everyone who attended one of the live stage performances at Guild Park's Greek Theatre in the past four years, saw the results of Sten's abilities and vision. He was an actor, director and an active participant on Guild Park issues. Ross added direction and an action-orientation to the board of Friends of Guild Park. An expert at organizing and advocacy, Ross had a notable circle of friends and many community interests. All of Guild Park benefited from his network and his influence. We extend our sympathies to all the friends and family members of these two men who helped put Guild Park on its path to revitalization. Dozens of Guild Park supporters recently celebrated past successes at the park and heard about all the activities scheduled for 2015 at this historic site. A special reception was held to announce upcoming activities at Guild Park. The March 2015 event included the informative talk, "Guild Park's Past & Potential," by Brendan Stewart, a landscape architect at ERA Architects Inc., who has close ties to Guild Park. Brendan was member of the consulting team that produced the 2014 Guild Park & Gardens Management Plan. Also, his grandfather, Donald Stewart, was a notable Canadian sculptor who created two “provincial panels” – Nova Scotia and Newfoundland – on display at Guild Park. Brendan gave a terrific historical perspective on the Guild Park site, including the importance of waterfront estates, such as the old Guild Inn, and how the property at Guild Park has evolved over the generations. The afternoon at Cedar Ridge Creative Centre included live music, catered food and drinks. It’s noteworthy that Cedar Ridge’s popular art classes, studios and galleries are all offshoots of the operations started at Guild of All Arts. Proceeds from the event’s silent auction will help cover Friends of Guild Park’s liability insurance and the various park permit fees at Guild Park for the 2015 season. The City of Toronto requires community groups to pay for these and other costs when they organize a park event that attracts more than 25 people. A big shout out of appreciation goes to everyone who attended – including our volunteers and donors – plus all those who continue to show such great support for Friends of Guild Park & Gardens. At the March 2015 reception, Friends of Guild Park President, John Mason, left, presents guest speaker, Brendan Stewart, with Along The Shore. The bestselling book, by local author Jane Fairburn, includes historical details about the old Guild Inn property and other waterfront sites in Toronto. (Photo by Barry Sheffer). Guild Park & Gardens requires a Master Plan to make high-quality priorities for the entire 88 acres of nature, art, shoreline, bluffs and history. Two of the City’s top officials - Mayor John Tory and City Councillor Paul Ainslie, who represents the area where Guild Park is located. 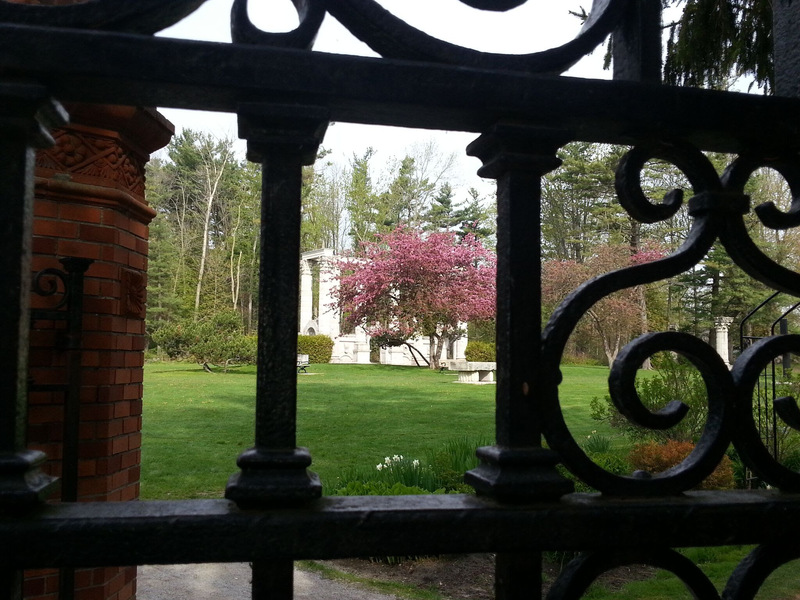 Guild Park has been the focus of dozens of plans and proposals since 1978, when Rosa and Spencer Clark sold their property, including the popular Guild Inn, to the Ontario Government. People have asked: Why does Guild Park need ANOTHER plan? The answer is to streamline and simplify how Guild Park is run. Responsibility for this unique public space has grown into a complex web of jurisdictions. The property is owned by the Toronto and Region Conservation Authority (TRCA), which is run bysix different municipal-level governments: Toronto; Peel; Durham; York; Mono; andAdjala-Tosorontio. Another complication is that years ago, TRCA contracted the day-to-day operations of Guild Park to what was then the municipality of Metro Toronto. Today, this work is the responsibility of more than a dozen departments within the City of Toronto. (see How Guild Park Operates). The result is no single department, agency or person is responsible for all of Guild Park. Instead, the property gets managed in “silos” – without overall integration, without overall vision and without a long-term plan. Last year, the City’s Parks, Forestry and Recreation (PFR) completed a detailed, 97-page “Management Plan for Guild Park & Gardens.” This report covered important issues PFR faces managing the parts of Guild Park for which it is responsible. This “management plan” identified 11 other plans and initiatives now underway that affect Guild Park’s future. Among these is the “current developmental proposal” for an on-site restaurant/banquet facility to replace the Guild Inn operations. Conceptual design for proposed restaurant/meeting hall at Guild Park (Image from City of Toronto website). Comment about the current development proposal at Guild Park. If people are serious about putting “best practices” in place at Guild Park, the priority is to commission one, integrated plan that covers the whole park and its multitude of diverse features. The “management plan described the “Master Plan” as a “public process” that identifies, evaluates and prioritizes the appropriate uses for the entire site. The Master Plan would take into account Guild Park’s unique location, its natural resources and its legacy to Canada’s art/cultural community. The “management plan” also made 32 other recommendations for improving Guild Park. 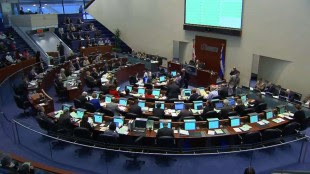 Those recommendations fall within the mandate of the City’s park’s department. Clearly, Guild Park’s “management plan” recognizes the importance of making a separate “master plan” a priority for revitalizing the entire site. After the release of this PFR report, both Toronto Mayor John Tory and Ward 43 City Councillor Paul Ainslie publicly gave their support to this priority. As well, three volunteer groups involved – Friends of Guild Park, Guild Renaissance Group and Guildwood Village Community Assn. – also agreed to support the launching of a Master Plan as soon as possible. Six months after park’s staff recommended a Master Plan for Guild Park, this important initiative has gained the backing of the community’s political leaders and Guild Park’s public stakeholder organizations. Now is the time to get the Master Plan started. To add your support, call the City’s info line 3-1-1 or contact your elected representative and tell them you support Mayor Tory’s and Councillor Ainslie’s call for an immediate launch of a Master Plan for Guild Park. Friends of Guild Park has compiled the following “Who’s Who” listing the different groups responsible for different parts of Guild Park. By our count, there are at least 15 different departments, divisions, agencies and organizations now involved in Guild Park operations. There are likely others, so this list may be incomplete. Restaurant Development Project – A team of City officials led by EDC (including Cultural Services, Planning, Real Estate, Legal. Also involved is the City-approved private partner, Dynamic Hospitality & Entertainment. This paints a picture of “all the fingers in the pie” when it comes to Guild Park operations. It also gives an indication of why progress at the property is so complicated and so difficult to measure. In addition to these government-based operations, the public activities at Guild Park are organized by a whole different set of organizations – the volunteer/not-for-profit groups responsible for arts festivals, open-air theatre performances, walking tours and other community events. This year, the following four organizations are programming events at Guild Park: Friends of Guild Park; Guild Festival Theatre; Guild Renaissance Group; and the GVCA. Toronto City Council, which convenes at Toronto City Hall, oversees all but one of the government groups that look after Guild Park & Gardens (Image from City of Toronto website). Thanks to the efforts of the Friends of Guild Park and our many supporters, "Guild Park & Gardens" now appears with its correct name on Google Maps for the first time! This means the park's historically accurate name is being shown on-line worldwide 24/7. “Guild Park & Gardens” harkens back to the original days of the Guild of All Arts, the artists’ colony founded on the property in 1932. “Guildwood” was the name coined to describe the community built much late, when homes were located in the “woods” near the “Guild.” Hence the name, Guildwood, which began in 1957. Mistakenly calling this property “Guildwood Park” is historically inaccurate and ignores 25 years of the site’s history as an arts centre and tourist destination. It also creates confusion with the similarly-named, but much smaller “Guildwood Village Park” nearby. 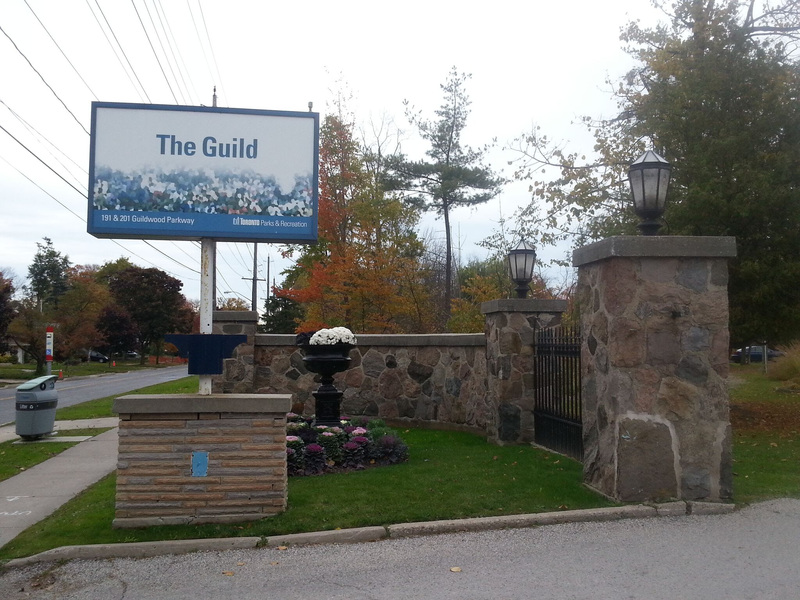 After learning the story behind the Guild Park name, various Jane’s Park participants phoned the City of Toronto’s 311 info line and/or contacted City Hall asking for the name correction. As well, local City Councillor Paul Ainslie requested City staff to make similar corrections and to contact Google Maps about making the change. Just 11 days after Jane’s Walk, this grass-roots message was heard by two major organizations - the City of Toronto (which manages the park) and Google. Google Maps is now using “Guild Park & Gardens”; the City of Toronto continues to make corrections to all the places where the park name is used inconsistently. Thanks to everyone who helped make the change get done on-line. Of course, correcting all the physical signs and printed references to Guild Park is ongoing. The existing road signs still in place are obvious examples that require attention. If you find further inconsistent and wrong names referring to Guild Park, please send details, with location, date and an image, if possible, to info@guildpark.ca. The Guild Park & Gardens name commemorates the Guild of All Arts, which began on the site in 1932. Over the years, a series of inconsistent and historically inaccurate labels have been applied to the property, as shown on the current sign at the park’s entrance. The Guildwood Village Community Assn. hosts its annual evening BBQ and entertainment for all GVCA members. Enjoy an afternoon walking tour of Guild Park, 2 p.m. start at park flagpole. Outdoor Movie Night at Guild Park (weather permitting). Disney’s Cinderella (2015). Organized by Toronto Civic Union Employees’ Union, Local 416 & Friends of Guild Park. Come early for some pre-movie fun with fitness guru Alka Sharma of Alka’s Total Fitness. The popular arts festival filled with unique crafts for sale, entertainment, community services. On-site food and licensed refreshments from the Olde Stone Cottage. Outdoor Movie Night at Guild Park (weather permitting). Disney’s Big Hero 6. Organized by Toronto Civic Union Employees’ Union, Local 416 & Friends of Guild Park. Friends of Guild Park & Gardens is proud to be part of the Great Canadian Shoreline Cleanup presented by Loblaw Companies Limited. We invite our members and supporters to help collect debris and garbage from the lakeshore area below Guild Park. Meet at the flagpole in the Guild Park front garden 201 Guildwood Parkway by 9:00 am. Bring sturdy walking shoes/boots and gloves and wear clothing appropriate for being outside. Location: Guildwood Community Presbyterian Church, 140 Guildwood Pkwy. Mark your calendars for our organization’s second AGM. All members and supporters are urged to attend. Includes reports about the “State of Guild Park” and organization committees; board elections, membership renewals. Followed by light refreshments. Free for members. Watch for more details. Goblins, superheroes, zombies, princesses and other dressed-up characters are invited for some spooky fun by the Greek Theatre. Pumpkin decorating, crafts, music, activities. Costume contests for kids (12 and under) and for pets (all types). Enjoy carols, hot chocolate, hot cider and special guests all outdoors to start the holiday season. Festivities from 7:00 to 8:15 pm. Bring your own mug for hot drinks! Annual memberships for Friends of Guild Park & Gardens are now available via our website at GuildPark.ca! An easy and secure way to join is by using your credit card or PayPal account after completing our online membership form. All payments use an encrypted process. For those who prefer traditional methods to sign up or renew your membership, simply respond to this email and you’ll receive a printable form, with full details on how become a 2015 member. To get in touch with us, please email newsletter@guildpark.ca.